YES! You are most welcome to sell the projects you make with our images. Giving credit is not mandatory, but we would certainly love if you shared us with others :). Do you reward for getting published? Yes, we do!! This is a great way to put those great stamps of yours to good use! To claim payment for your SNSS publication, please send a clear scan of the page your project is on, the title and date of the publication and your PayPal email address to korin@sweetnsassystamps.com. Claims must be made within 2 months of publication release. Publication rewards will be sent via PayPal within 1 week of receiving your claim. So what are you waiting for? Submit, submit, submit!! We do our best to ship orders within 1-3 business days however, depending on the number of orders we are processing it could take up to 7 business days for your order ship. Holidays may delay shipping even longer. If you are concerned about the length of time it is taking for your order to arrive, please check our website for announcements and email us with any questions. Sweet ‘n Sassy Stamps ships from GA.
We do not ship partial orders. If your order includes any backordered or pre-order items, we will wait and ship your entire order together. WITHIN THE US: US orders ship via USPS First Class Mail for $3.95 OR USPS Priority Mail for $7.25. 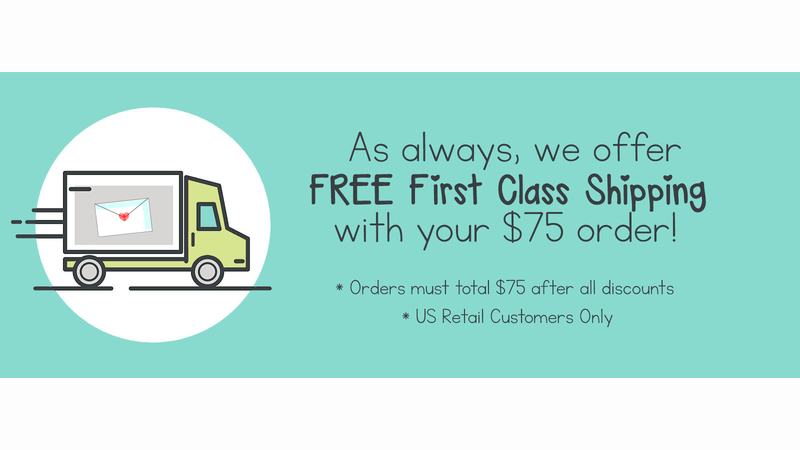 We offer FREE First Class shipping for US orders of $75 or more. OUTSIDE US: Our international shipping prices are typically based on weight starting at a flat fee. All international orders are shipped First Class International via USPS. You may estimate your shipping cost with our shipping calculator found in your shopping cart. What are your clear stamps made from? Sweet 'n Sassy stamps are made of a high-quality clear photopolymer that resists yellowing. They will arrive at your door on a clear acetate carrier sheet ready for immediate use! How do you use clear stamps? Clear stamps make stamping easier and more fun than ever. They are more versatile than traditional rubber stamps because you can vary their placement and you can SEE where you are stamping. No more trouble with lining up your images! Simply peel your stamp off the carrier sheet or storage case and place the image on your acrylic block. No adhesive required! When you are done stamping, clean your stamp and place it back on it's carrier sheet/storage case. It's that simple! How cool is that? How do you care for clear stamps? There are some things you must keep in mind when using clear stamps. You must be very careful when peeling them off anything they are stuck to. The best way to peel them is lift the edge gently with your thumb and index finger and pull it slowly and gently toward yourself. Do not use a jerking motion as this may cause the stamp to tear. If your stamp loses it's tackiness, clean the back of the stamp (the flat part) with your stamp cleaner and it should stick as good as new. If you still have trouble with your stamp sticking, it most likely means that your block needs cleaned. Clean it with the same cleaner you used for your stamp and dry it with a cloth. Clear stamps will stain with the use of some inks. This is normal and will not affect the use of the stamp. With proper care, your clear stamps will last a lifetime! If you are not satisfied with your purchase or your product is defective, we will accept returns within 30 days of you purchase for a full refund of the purchase price. After 30 days, we will issue a store credit.